Rajkummar Rao's movie Trapped has received positive reviews from Bollywood critics and celebrities. Rajkummar Rao's Trapped will be released in theatres on Friday, March 17. Ahead of the film's release, a special screening was held on Wednesday for the who's who of Bollywood. The movie has received a phenomenal response from critics and celebrities alike. Critics say that the Vikramaditya Motwane-directed film is intriguing and keeps viewers glued to their seats throughout. They have also been lauding Rajkummar's stellar performance. Trapped narrates the story of a man Shaurya (played by Rajkummar) and his fight for survival, after accidentally getting locked inside his high rise apartment in Mumbai. The film has been co-produced by Madhu Mantena, Vikas Bahl and Anurag Kashyap. 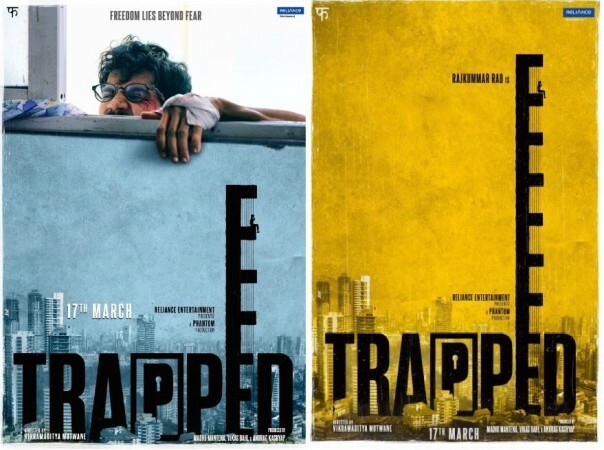 The trailer of Trapped had a received positive response from viewers, making movie buffs eagerly wait for the film. Mayank Shekhar of Mid-Day said: "That 'Trapped' manages to grippingly hold your attention with such an underwhelming setting is an achievement in itself. That it could invade your senses makes it worth every minute, without any break, in the theatre." Renuka Vyavahare of the Times of India said: "Driving this one-man show is a terrific Rajkummar Rao, who allows the film to solely feed on his character's despair. His ability as an actor to portray this ordeal is astounding. Given the nature of the story, 'Trapped' does test your patience after a while. You also doubt the protagonist's intelligence and sanity. Why would you rent a flat from a dubious agent, in an empty building? A few occurrences seem implausible. How come even fire doesn't draw any attention? Nonetheless, the mounting tension makes you overlook these flaws and a bloated run time." Rohit Vats of Hindustan Times said: "Motwane and Rao form a lethal team that keep us hooked for 102 minutes, quite easily. Trapped is unique because it's unlike any other one-room drama. It remains a personal story, more like a leaf out of Shaurya's life than a cinematic celebration of a survivor." Shubhra Gupta of Indian Express said: "The trouble with Trapped, in which Rao is practically a solo act, is that it is uneven. There are not enough genuinely scary heart-in-mouth moments. Given Motwane's skills at creating emotions, and Rao's ability to channel them, Trapped doesn't take us as far over the edge it could, or should have." Surabhi Redkar of Koimoi said: "Trapped promises a brilliant performance by Rajkummar Rao. This engaging tale is not everyone's cup of tea. Vikramaditya Motwane's story has no timeline and in certain cases, the story fumbles with its cinematic liberties. Those having a penchant for survival dramas will find it intriguing enough." Kartik Aaryan‏: "#Trapped us all with your brilliant performance bro @RajkummarRao #VikramadityaMotwane Sir Take a bow"
Shot by Vikramaditya Motwane during the Trapped Screening. He has outdone himself once again with Trapped!